In early December, 2012, I brewed up a batch of Blast, the start of a series of Imperial IPAs known as Alpha Acid Aspirations. Blast is my first attempt at adding rolled oats to the grist in order to achieve mouth feel within a DIPA while trying to keep the beer dry. It is also the first time I have used Pilsner malt in a DIPA. I believe I achieved the mouth feel I was going for (read more below) but I didn’t feel the beer was as dry as I would like in a DIPA. Possibly the oats but I usually use one pound of sugar, this time I only used a half pound. I did mash at 150 degrees which should be about right. I feel I have two courses of action next time: less oats or lower mash temperature. Don’t want to try both at the same time as I don’t know which one would be the difference changer and to what degree. The Pilsner malt didn’t do anything fantastic to the overall flavor or aroma of the beer. I wasn’t looking for much and achieved it precisely. I don’t think I will use the more expensive malt in the future. Save my pennies for the next batch. Per typical I have taste tested this beer a good three or four times prior to the write up. 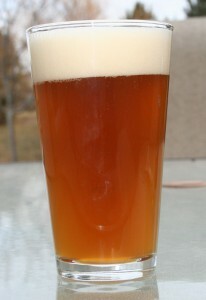 Look: The beer has a cloudy haze that limits visibility to 50%, while darkening the beer to deep orange/gold color. The foam is an inch high of tightly packed tiny bubbles. Retention is right on for a DIPA with thick, coating lacing, even in spite of the oats. Aroma: Hop forward. Bright orange citrus and tropical scents fill the nostrils while a touch of pine follows through. Malts are subdued, as expected, giving off ideas of grain and bread/dough. I think this might be a product of both the Pilsner and oats. Taste: A burst of tropical and orange hops flavors label the palate. Lightly toasted bread holds up the malt end. The finish brings more hop, leaving a trailing orange and pine bitterness that doesn’t over power but does dull the buds. Drinkability: Medium body or better with, at best, medium carbonation. Drying but juicing fruit can be had as well. Needs to be drier. Overall: This beer is all about the hops; keeping with my west coast DIPA style. I will make this beer again, as the overall profile of the beer is pleasing, just a couple of flaws. A bit of tweaking should make this a staple in the home brewing repertoire. Viva the hop. Part two in the Alpha Acid Aspiration series was dry hopped today as well. Should be ready in about two weeks. More delicious DIPA to come. Enjoy! Useless Fact: A person cannot taste food unless it is mixed with saliva. For example, if a strong-tasting substance like salt is placed on a dry tongue, the taste buds will not be able to taste it. As soon as a drop of saliva is added and the salt is dissolved, however, a definite taste sensation results. This is true for all foods. 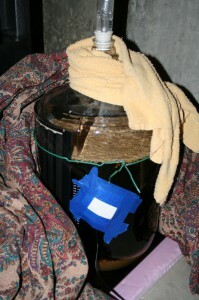 Blanket, heating pad, temperature probe to keep fermenting wort comfy in the basement. Back a little over a year ago when I first brewed Bad Tipper, I felt like a pioneer. The one brewing club that I am is more of a “beginners” club that people graduate from. I have never heard conversations about such things except in dark corners in the back under hushed tones. I was venturing into wild yeast and bacteria for the first time in my brewing career and, the best of my knowledge, anyone in my brewing club. Exciting to say the least. That first batch also set me on the path to realizing I would be brewing this beer every year. The ideas of what I could do with this beer have been grand. A bad spring that killed off the sour cherry crop ended one train of thought. What to do? I know, brew the beer again and blend them into a used bourbon barrel. The new batch can be used for top-off, if needed, and I can use some the new batch with sour cherries this year (here’s hoping for a great crop). The second annual brew day of Bad Tipper Oud Bruin went well. The numbers were close but more importantly the process seemed to go well, I wasn’t distracted and the new fermentation process I am using is going to only make my home brews more tasty. The goals of using this beer in conjunction with the inaugural batch along with some cherries (possibly more blending options) is what home brewing is all about. Enjoy! Saccharification Rest @ 157*F for 60 minutes. Note: this recipe is straight from Brewing Classic Styles: 80 Winning Recipes Anyone Can Brew by Jamil Zainasheff and John Palmer. Time seems to be at full warp speed anymore. Days, week, months seem to last no longer than a blink of an eye with my memory being about the same. Last year I made a few resolutions that I would like to revisit while making a few more predictions for the year ahead, 2013. I brewed 20 times. During the year I tried new tips and tricks to get better mash efficiency, get acquainted with Brett, better fermentation temperatures, etc. Myself and my friends get a win from better brewing. Outside of some nuttiness late in 2012, I spent $30 or less in eight of the months on American craft beer. The cellar is still large but there was a small dent placed in its’ side. Most of the breweries I visited in 2012 were on the Ohio trip. I got my five in, barely. 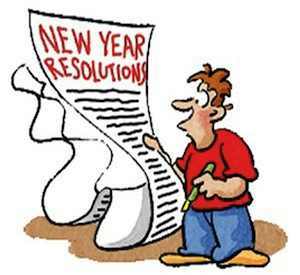 My 2013 resolutions aren’t going to be that much different but maybe a bit more precise. 20 brews is a nice round number. I don’t have to hit that many or I could go over throughout the course of the year. That isn’t the goal. I want to finish getting the last few pieces to my home brewery that will allow me to be a better and more self reliant home brewer. Keep American craft beer expenditures to near or lower than 2012 levels. Use the saved money to help achieve number one. Visit five new breweries in my home state of Illinois. I have been to very few locally, time to expand the breadth of Illinois craft beer appreciation. I hope everyone has a healthy 2013 aided along the path by a dose of American craft and/or home brew. Enjoy! Useless Fact: In a very early draft of Raiders of the Lost Ark, Indiana Jones carried brass knuckles instead of a bullwhip. You are currently browsing the Sips blog archives for January, 2013.